Solvaderm Skincare recently sent me a bottle of Ace-Ferulic to try, and share the results with you all. Below you will find a product description provided by the company, as well as my experience with the product and my honest opinion of it. ACE-FERULIC is an advanced rejuvenating serum that promotes dermal restoration and provides a powerful defense against skin aging due to sun exposure and environmental stressors. Dermatologist-formulated triple-blend of antioxidants neutralize free radicals to eradicate the oxidative stress that can harm skin over time. Enhances skin’s ability to fight signs of photo aging by providing protection against the sun’s damaging ultraviolet radiation. Professional-strength treatment improves the structure of the dermal layer by boosting the synthesis of skin-supporting and strengthening collagen and protein fibers. The nourishing, penetrating blend delivers curative and preventive benefits to dramatically improve skin’s overall appearance, texture, and tone. 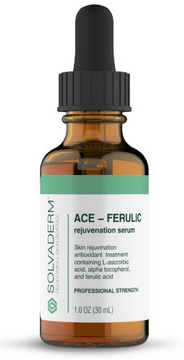 Ace-Ferulic is an acidic serum that helps bring fresh new skin cells to the surface. While this serum is an antioxidant, I find that it works best at night, as I personally feel it burns slightly, meaning it is leaving your skin vulnerable to extra damage from the sun and more sensitive than usual as well. I enjoyed using this serum as a part of my evening skincare routine, and found that it left my skin brighter, more smooth, and my complexion clearer too.